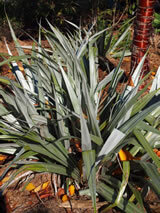 Distinctive NZ native perennial with bold silver sword like leaves. Gives a wonderful contrast with other plants. Naturally occurs on the Chatham Islands. Best results when planted in a site that does not dry out. Spikes of greeny-yellow flowers followed by orange berries.